The young skipper of the fishing boat Spot X in Paihia had held his full skipper’s licence for just over two years. “I started off working on the Alma G,” he said, “have you ever heard of Zane Grey? He was a famous fisherman.” I nodded and said, “Yes” I had heard of him and that he was an even more famous author. It was Zane Grey who first put Bay of Islands’ fishing on the global map. Well that’s not actually true. It was Captain Cook who first named this spot in Northland in 1774, but it was Zane Grey the western fiction writer and big game fisherman who successfully spent a summer here in 1926 fishing from the Alma G for blue and striped marlin that revealed this remote location to a worldwide audience when his book, Tales of the Angler’s Eldorado, New Zealand was first published. The day before, I’d taken my passion for adventure to new heights when I donned a life vest and parasailing harness. Richard, the skipper, was an American and he readily admitted he had spent his whole life associated with parasailing. His 9.5m long boat was powered by a 330 Volvo common rail diesel engine. It was just three weeks old and purpose built in his home state of New Jersey. It was comforting to know that Richard was a man who knew the ropes well, especially the ropes attached to my parasail. We were quickly out into Paihia Harbour, and after a short safety briefing I was attached to the hand rail that was attached to the parasail. Moments later I was gently gliding aloft and swinging my legs freely. More and more rope was released and the view right across the Bay of Islands was stunning. However, this isn’t just an ordinary parasailing joyride – it is New Zealand’s highest parasailing adventure. ? ?Once the full length of the stern line was out I realised what it was like to reach an altitude of 1,200ft or 365m. To put it in perspective the Auckland Sky Tower is a mere 324m high. Up in this rarest of places I couldn’t see the other people or the skipper on the boat, which by now had become a little white dot on the water. Pushing the boundaries is what adventure tourism is all about I said to myself, as I rocked gently back and forth. This 10-12 minute adventure is all it is definitely hyped up to be…and the rest. It’s not often that you get to reach a maximum height and a maximum speed in one day, but then this was no ordinary day. As I sipped my first glass of chardonnay in the stunningly located Bay of Islands Lodge, where I was staying, I was already bragging quietly to some American guests about the day’s parasailing and boat ride, the sort of adrenalin rush that is hard to beat, but Peter, my host, made sure I was well and truly spoilt that evening when he cooked for my dinner some superb salmon steaks, rice and a richly tossed mixed salad. The next morning I took the short car ferry ride over to the delightful town of Russell. On check-in at the refurbished Duke of Marlborough Hotel I noticed their catch phrase . . . 170 years old, 100 wines, 25 rooms, 30 beers, a great menu and a million dollar view. Now that’s impressive as this hotel and restaurant is now starting to sparkle like the grand old duchess she is. At 9.45am I was picked up from the pier by Carino Sailing and Dolphin Adventures. This is a small 100% New Zealand owned cruising company. The owners love the Bay of Islands and as I was about to find out, they are committed to giving you a fun and relaxing way to experience sailing and swimming with dolphins. Once we had anchored in a beautiful bay I suddenly realised just how close you can get to the dolphins, where they simply encircled the yacht. Swimming with them is immensely pleasurable and there was nobody on board who wasn’t in awe. This is the only family owned yacht licensed to do this. It made for a sensational day and a unique marine encounter. After swimming with those amazing sea creatures it was hard to order anything from the menu that had been plucked from the ocean. I was at dinner in the Duke of Marlborough’s beautiful chandelier bedecked dining room, so I plumped for good old fashioned roasted rack of lamb rubbed in citrus pepper with Serrano wrapped leeks, baby potatoes and kasundi jus – sensational. My free day in Russell the following morning I opted to wander at leisure and then take an 11am Russell Mini Tour, a one hour way to soak up the history of the place with an informative local tour guide. After lunch I then checked into the delightful Flagstaff Lodge and Day Spa, a fully restored 1912 villa set a block back from the Russell waterfront. With just four individually decorated en-suite rooms it offers a slice of tranquillity and comfort – and don’t miss their complimentary wine and canapés they serve between 5-6pm!? ?It would also be remiss not to mention Russell’s award winning Bay of Island’s restaurant right near the pier called Kamakura – beautiful food, great service and on the balmy evening when I dined, one of the best views across the bay back to Paihia as the setting sun sparkles of the bay’s lapping waves. Detouring on my way back from the Bay of Islands I had one last adventure that I’ve always craved doing. In Hokianga Harbour I was transferred by ferry boat from the Opononi Wharf across the harbour to meet Andrew Kendall from Sandtrails Hokianga. Andrew offers personalised dune buggy tours over the famous sculptured sand dunes, into canyons and along the beaches of this spectacular region. As a Maori and having grown up along the beach, Andrew is so familiar with the dunes he can almost name each one. For a remarkable introduction to Maori history and a thrill ride to remember, Andrew’s tours do not disappoint. Eldorado (the golden one) became the name of a legendary “Lost City of Gold” that has fascinated – and so far eluded – explorers since the days of the Spanish Conquistadors. ? 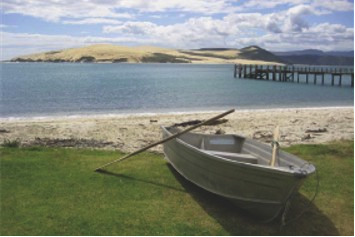 ?From the terrace at the Copthorne Hotel in Omapere, I looked back across Hokianga Harbour to the sand dunes that were bathed in a golden hue from the last of the sun’s rays. It was a magnificent way to end my four adventurous days in Northland. Copthorne Hotel & Resort, T: 0800 808 228, www.millenniumhotels.co.nz? Duke of Marlborough Hotel, 35 The Strand, Russell, T: 09 403 7829, www.theduke.co.nz? Excitor Fast Boat Adventure,T: 0800 653 339, www.awesomenz.com?